What Fruit Is High in Calories? Most fruit is a healthy choice, low in fat and calories, but some fruit is high in calories and should only be consumed in moderation. Even high-calorie fruit holds many nutritional benefits, however. Fruit can be fresh, frozen, canned, dried or juiced. Depending on how the fruit has been prepared, the calorie count can vary. According to the Health Castle website, the Food and Drug Administration confirmed that frozen fruit can provide the same nutrients and benefits as fresh fruit. Canned fruit and fruit juice typically have more calories due to either the syrup or sugar added. 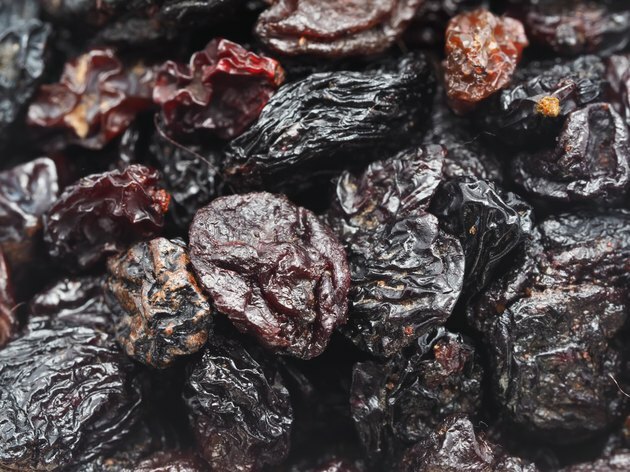 Dried fruit, such as raisins and prunes, are higher in calories than fresh fruit. Raisins, the product of dried grapes, are sweet and chewy, with one cup containing 432 calories. Prunes, sticky and chewy with a dense taste, have just over 400 calories per cup. Dried fruit generally is more compact and calorie-dense, unlike regular fruit, which is high in water content. Fruits high in calories include avocados, figs, dates, raisins, prunes and coconuts. Dates, shiny in appearance, have an overwhelming 500 calories per cup. They are sweet tasting and very low in moisture. One cup of shredded coconut has a dense 283 calories. The meat inside is white and mildly sweet. Neither the coconut nor the avocado has an edible skin. One cup of avocado slices boasts 235 calories. It is a buttery, nutty flavored fruit, known for being guacamole's primary ingredient. Fresh figs, with one cup holding 167 calories, are sweet and chewy. Avocados have oleic acid, a monounsaturated fat that may help to decrease cholesterol levels, according to the World's Healthiest Foods website. Both avocados and figs are a good source of potassium, which may help regulate blood pressure. Figs are also a good source of fiber. The Cooky Coconuts website says coconuts are high in lauric acid, an antiviral, antibacterial and antifungal substance. Dates are high in the antioxidants known as polyphenols. According to the Fruits and Veggies More Matters website, the U.S. Department of Agriculture says dates are higher in polyphenols than most other fruit and vegetables. Prunes are high in antioxidants as well as vitamin A. They are also a good source of potassium and fiber, helping to lower cholesterol and regulate blood sugar. Raisins are a good source of antioxidants, potassium, iron and boron, a mineral that plays a role in bone health. If you are trying to lose weight, snacking on an avocado or coconut may not be the best choice. Avocados and coconuts also have a high fat count, though most of the fat is of the healthy variety. Figs and prunes contain oxalates, which can build up in the body and cause health problems. According to the World's Healthiest Foods website, oxalates may also interfere with calcium absorption. Dates are high in sugar, at 125g in one cup, as are prunes, at 73g in one cup, and raisins, at 93g per cup. Fruit can be consumed in a variety of ways. It can be eaten alone, in a dessert, grilled or in a salad. Fruit is commonly made into smoothies, or added to frozen yogurt or ice cream. Fresh or frozen fruit is the most dense nutrient form. Both fresh and frozen fruit can be juiced for a beverage without the added sugar usually found in already made fruit juices.